This series has replaced Memoirs of the Botanical Survey of South Africa and Annals of the Kirstenbosch Botanic Gardens, which the South African National Biodiversity Institute (SANBI) inherited from its predecessor organisations. The plant genus Strelitzia occurs naturally in the eastern parts of southern Africa. It comprises of three arborescent species, known as wild bananas, and two acaulescent species, known as crane or bird-of-paradise flowers. The logo of SANBI is partially based on the striking inflorescence of Strelitzia reginae, a native of the Eastern Cape and KwaZulu-Natal that has become a garden favourite worldwide. It symbolises the commitment of SANBI to champion the exploration, conservation, sustainable use, appreciation and enjoyment of South Africa’s exceptionally rich biodiversity for all people. While the crop grower is reliant on the beekeeper for the pollination service his honeybees provide during the flowering season, the beekeeper in turn depends on variable forage resources and habitats to sustain his honeybee colonies throughout the year, and to provide him with a honey crop. 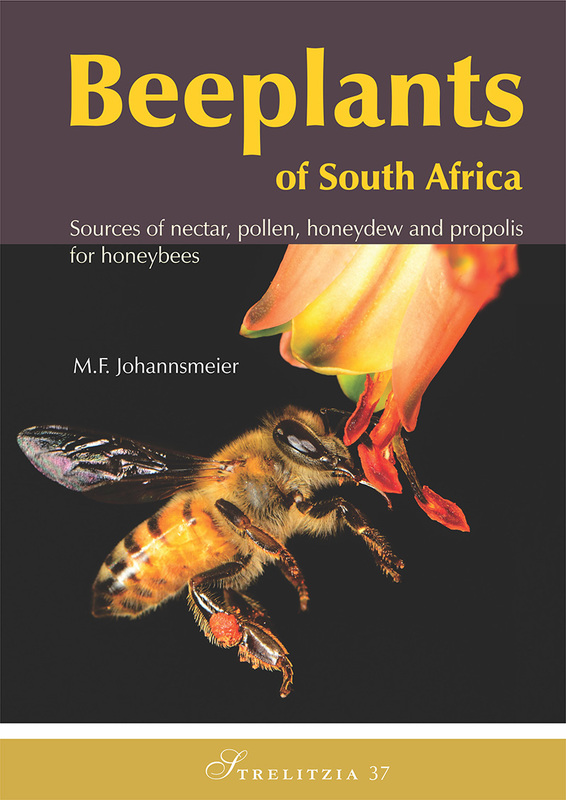 Beeplants of South Africa: sources of nectar, pollen, honeydew and propolis for honeybees attempts to furnish beekeepers with information on the nectar and pollen value of South African beeplants, whether indigenous or exotic, grown in orchards or plantations, or whether ornamentals or weeds. Additionally, flowering times are documented and the pollination needs of crop plants are addressed. The applicable beeplant values can assist gardeners, farmers, beekeepers, or practitioners in environmental impact assessments or rehabilitation projects, in deciding which plants to utilise, conserve or grow for multi-purpose usage. 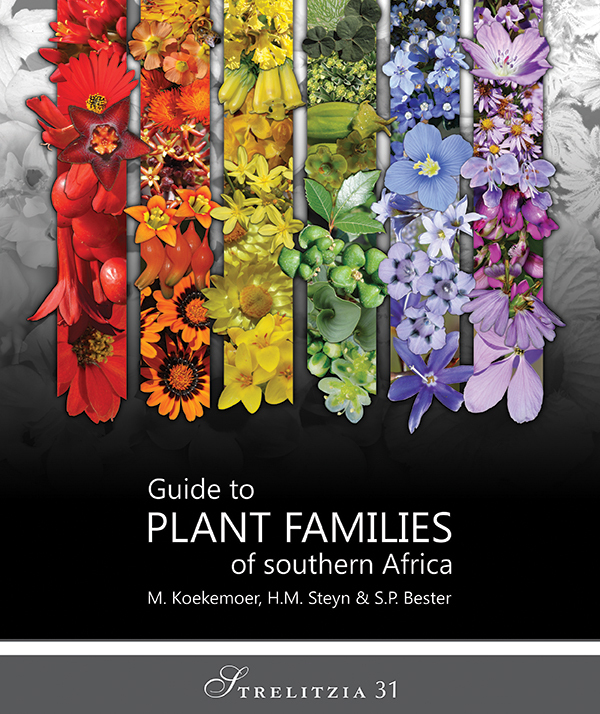 This book contributes to the outcomes of the Global Pollination Project and the Honeybee Forage Project, both implemented by the South African National Biodiversity Institute (SANBI). 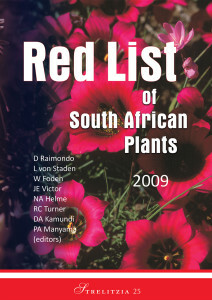 Contains an extensive index to the scientific as well as English and Afrikaans common names used in the publication.Published by the National Botanical Institute (NBI). Hardcover, A4, pp. vi + 550. 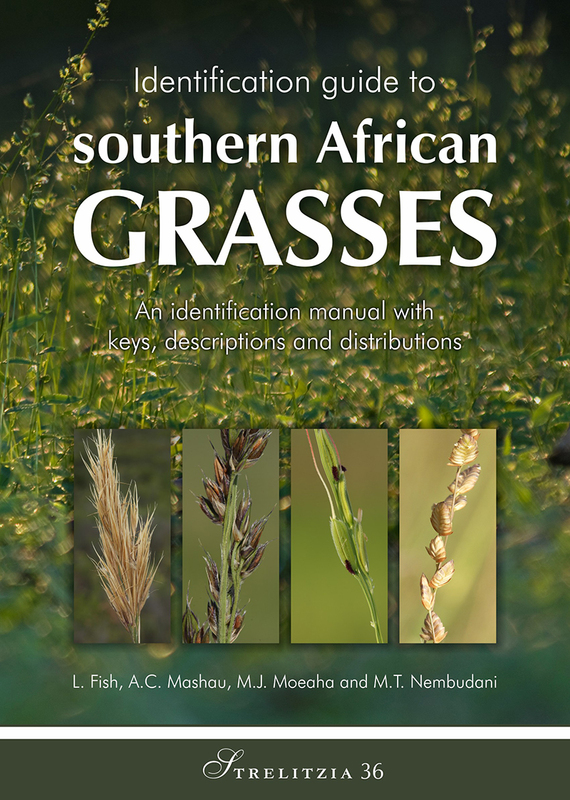 This identification guide to grasses of southern Africa relies primarily on the use of keys and descriptive information to aid the used in identifying grass species. 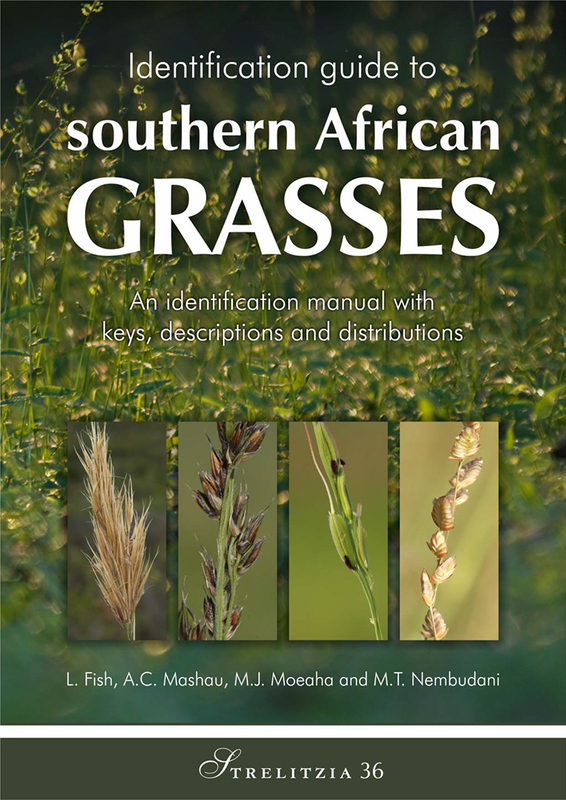 It contains some of the best information needed to identify southern African grasses. Keys to grass genera and species are provided, and in some instances also to easily confused taxa. For each species, a combination of useful characters is provided, and where applicable, line drawings of the spikelet or parts thereof accompany the identification key and description. Species descriptions and distribution maps are important and add to the identification of grasses. One or more line drawings or a scanned herbarium specimen accompany the description of each genus known to occur in southern Africa. Anatomy vouchers and voucher specimens are listed for each species discussed. Hard cover. A4. pp. ix + 798. Plastid and nuclear DNA sequence analyses show that the sub-Saharan African genus Lapeirousia Pourr. is paraphyletic as presently circumscribed. 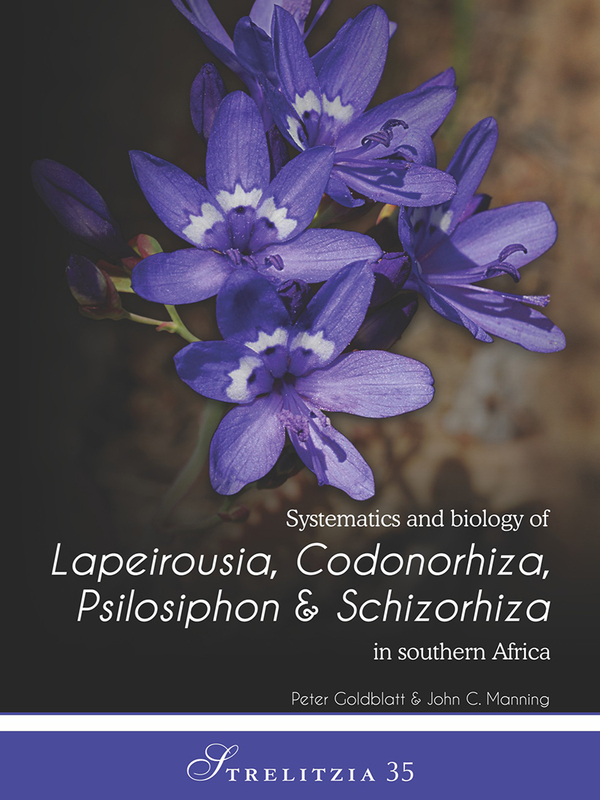 Species of Lapeirousia are retrieved as a clade in which are nested the tropical African genera Cyanixia Goldblatt & J.C.Manning and Savannosiphon Goldblatt & Marais as sister to Lapeirousia sect. Paniculatae Goldblatt plus the taxonomically isolated L. neglecta Goldblatt. To preserve taxonomic monophyly we dismember Lapeirousia, recognising the new genera Codonorhiza Goldblatt & J.C.Manning for L. sect. Fastigiatae Goldblatt (7 spp.) and Schizorhiza Goldblatt & J.C.Manning (1 sp.) for L. neglecta, both from the Cape Floristic Region, as well as Psilosiphon Welw. ex Goldblatt & J.C.Manning (15 spp.) for L. sect. Paniculatae, all from tropical and eastern southern Africa. 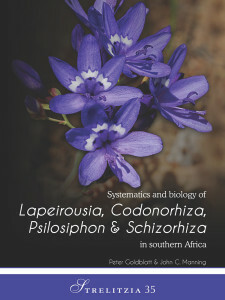 This leaves Lapeirousia (27 species) centred in western southern Africa, but also represented in south tropical Africa. We revise the infrageneric taxonomy of Lapeirousia in light of the molecular phylogeny, recognising sect. 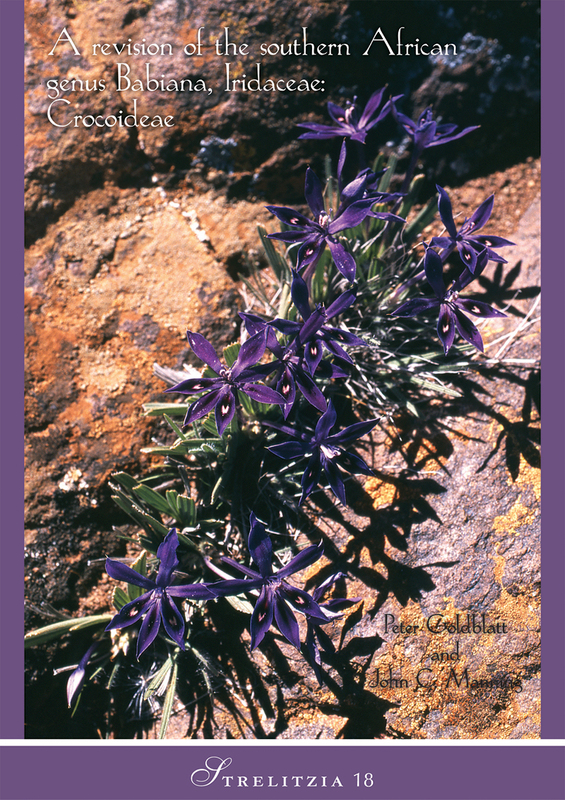 Chasmatocallis (R.C.Foster) Goldblatt & J.C.Manning, sect. Lapeirousia and sect. Sophronia (Licht. ex Roem. & Schult.) Goldblatt & J.C.Manning. We provide dichotomous keys to the four genera in southern Africa and full revisions of all four genera. Six new species, two of Codonorhiza, three of Lapeirousia and one Psilosiphon are recognised; two subspecies are raised to species rank, and L. angustifolia Schltr., currently included in L. pyramidalis (Lam.) Goldblatt, is also recognised at species rank. Four new subspecies are described. Soft cover. 180 × 240 mm. pp. v + 146. 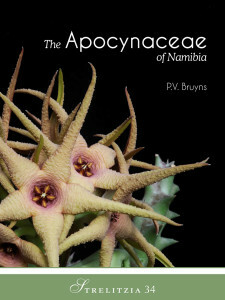 The Flora of Namibia is dominated by the families Poaceae, Asteraceae and Fabaceae. Here, an account of the Apocynaceae, the seventh largest family in Namibia, is presented. A total of 153 species belonging to 46 genera are recorded as occurring naturally for the country and 19 of these species are endemic to Namibia, with two endemic genera. More than half of these 153 species belong to the tribe Ceropegieae, with the highly succulent group, the stapeliads, represented by 58 species. It is shown that the family is most diverse in the extreme south of the country, in the Rosh Pinah and in the Karasburg districts. The distribution of each species is mapped and, for many genera, one species is illustrated with line drawings. Lectotypes are selected for several species. Soft cover. 180 × 240 mm. pp. 164. 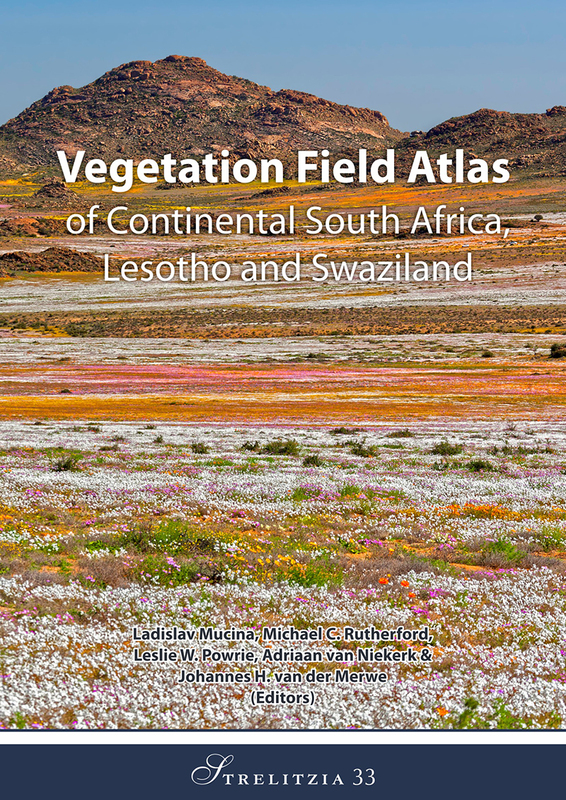 This booklet is a product of the National Vegetation Mapping Project that gave South Africa a comprehensive classification and description of more than 400 vegetation types and a new, modern vegetation map. Chapter 18 of the manual to the vegetation map is republished here in an atlas format for use in the field. 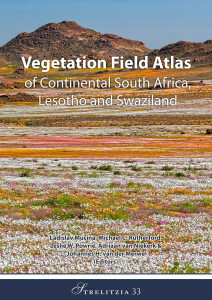 The Field Atlas features the vegetation of South Africa (excluding the sub-Antarctic islands), Lesotho and Swaziland on 46 sheets. As a new addition, an original detailed map of the vegetation of the Cape Peninsula has been added to mark the direction of further development of fine-scale vegetation mapping in South Africa. The Field Atlas is printed on water-proof paper to make it fit to withstand adverse weather conditions during field work. Hard cover. A4 ring-bound. pp. 52. 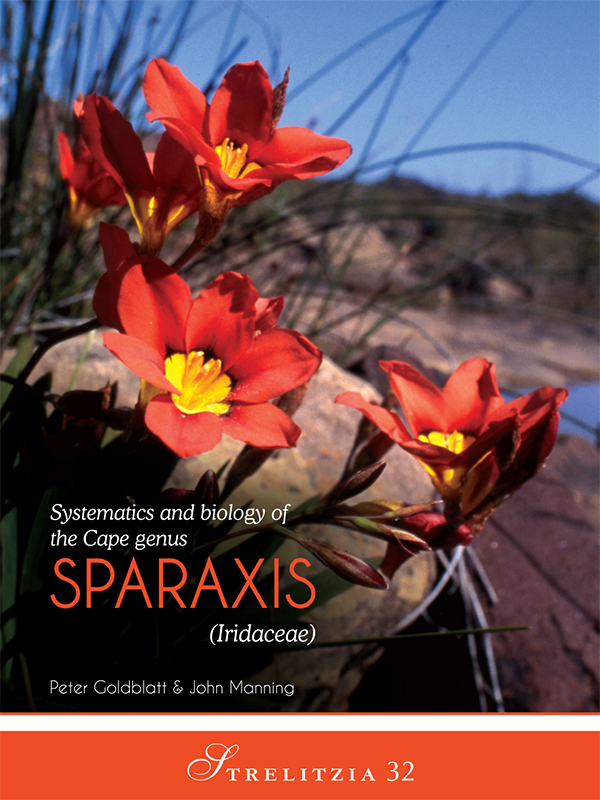 The South African genus Sparaxis Ker Gawl., a member of tribe Ixieae of subfamily Crocoideae of the Iridaceae, is endemic to the western half of the winter rainfall zone of southern Africa. 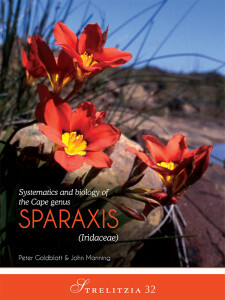 The genus, described by John Ker Gawler in 1802 for species until then referred in Ixia L. or Gladiolus L., includes 16 species in this monographic account. One of them from lime-enriched habitats near Saldanha Bay, S. calcicola, is new to science. All species are corm-bearing, seasonal geophytes with horticultural potential, and one species, S. tricolor, is widely available in the horticultural trade. Molecular systematic study using nuclear and plastid DNA loci confirms morphological study that the genus Synnotia Sweet is nested in Sparaxis and provides the basis for an infrageneric classification subdividing the genus into two sections. The molecular phylogeny is largely consistent with relationships inferred from morphology and shows that radial symmetry of the perianth probably evolved at least twice from ancestors with bilaterally symmetric (zygomorphic) flowers. These shifts in floral symmetry are pollinator-driven and are correlated with shifts from ancestral pollination by large-bodied anthophorine bees to either generalist pollination by multiple pollinator groups or to pollination dominated by hopliine beetles. Based on relationships inferred from molecular phylogenetic studies, pollination dominated by hopliine beetles evolved three times in the genus and long-proboscid fly pollination twice. We review the floral biology of the genus and provide full taxonomic accounts for all species, accompanied by illustrations, distributional information, conservation status and taxonomic history. Soft cover. 180 × 240 mm. pp. 80. Southern Africa has a total of 225 plant families with the 52 largest families covering over 90% of the flora. The large number of plant species in this region (ca. 24 000) makes identification to species level relatively difficult and the first step is usually to determine the family to which a specimen belongs. Knowledge of plant families allows one to place unknown plants into broad categories and then to focus on a smaller search for the correct name. This book aims to introduce readers to the beauty and diversity of our fascinating flora, and to enable scholars, students, amateurs and professionals alike to identify plants to family level. The identification process is introduced in a predominantly visual way by providing images to identify the key diagnostic characters for each family. The beauty of, and variation within each family is comprehensively illustrated with images of a range of genera. Additional information is provided on the distribution and usefulness of each family. It is hoped that this book will inspire readers to appreciate our indigenous flora. 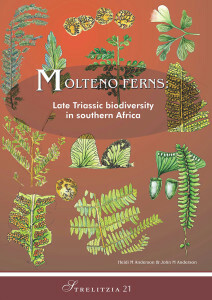 Published by SANBI Publishing (South African National Biodiversity Institute), Pretoria. Soft cover. 210 × 250 mm. pp. 300. No. 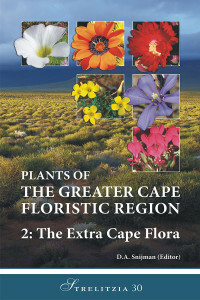 30: Plants of the Greater Cape Floristic Region volume 2: The Extra Cape Flora. 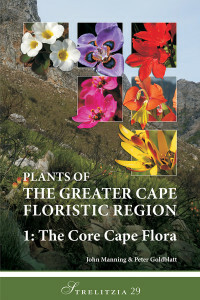 The Greater Cape Floristic Region of southern Africa, with an estimated 11 423 native vascular plant species, has one of the richest temperate floras in the world. The newly named Extra Cape Subregion comprises the northern, semi-arid part of the Region. 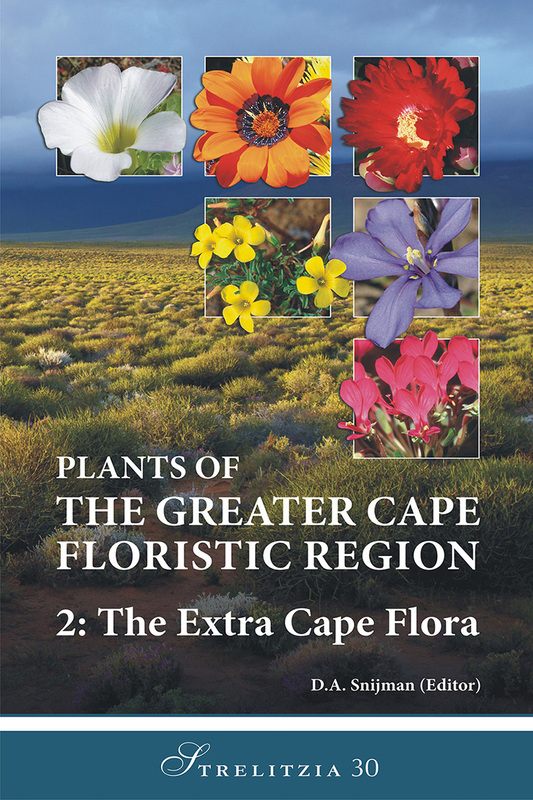 Covering 98 900 km2 and incorporating 92% of the Succulent Karoo Biome, the Extra Cape Subregion has an estimated 3 715 native vascular plant species – ferns, other spore-bearing vascular plants and flowering plants – of which 40% are endemic. Hard cover. pp. 544 + xii. The flora of the southwestern tip of Africa is one of the richest in the world. 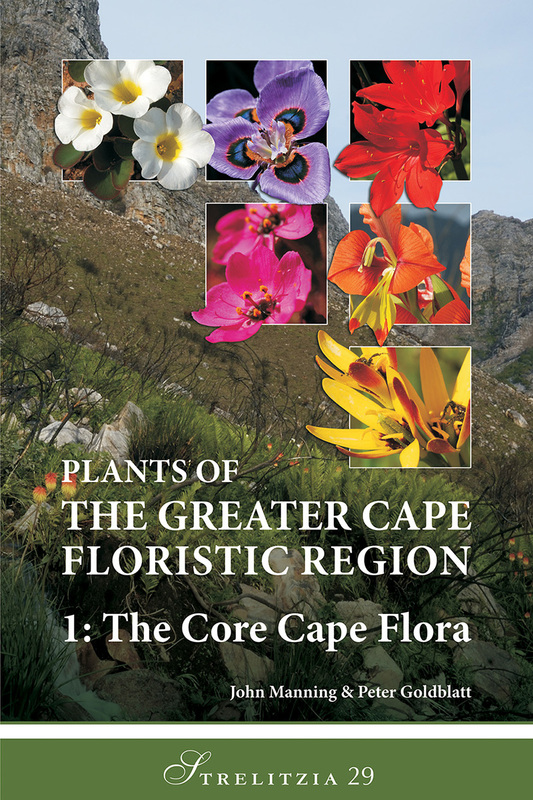 Recognised historically as the Cape Floristic Kingdom or Region, it encompasses a land area of 90 760 km2 with some 9 400 species of vascular plants (ferns and other spore-bearing vascular plants, gymnosperms, and flowering plants), of which just over 68% are endemic. Nearly half of all vascular plant species recorded in southern Africa, and around one fifth of the species recorded in sub-Saharan Africa, occur here. This treatment is a concise account of all known species, arranged according to the most recent systems of classification. Hard cover. pp. 853 + xiv. 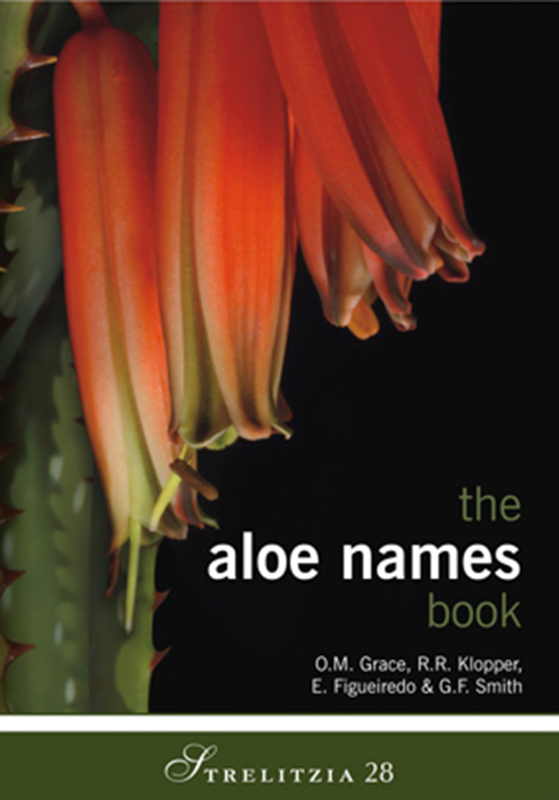 The aloe names book contains an annotated list of names for the genus Aloe, and is intended to provide a quick reference for checking names and key information about aloes. Accepted names are used in part one, where some of the more common species are also illustrated, as well as etymology, synonyms and all the known common names (given in various South African languages). Part two deals with names for which the exact application is unknown, part three with references, and part four lists the synonyms and common names. Hard cover. A5. pp. viii + 231. 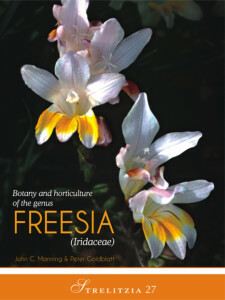 Freesias are well-known throughout the world as striking plants that add colour and fragrance to any garden or bouquet. Chapters include various aspects of botany such as the taxonomic history, phylogenetic relationships, systematics and a key to species. Additional useful information is provided on the ecology, biogeography, speciation patterns, horticultural history, and cultivation of freesias. A complete analysis of the floral scent chemistry of 13 taxa is also presented. 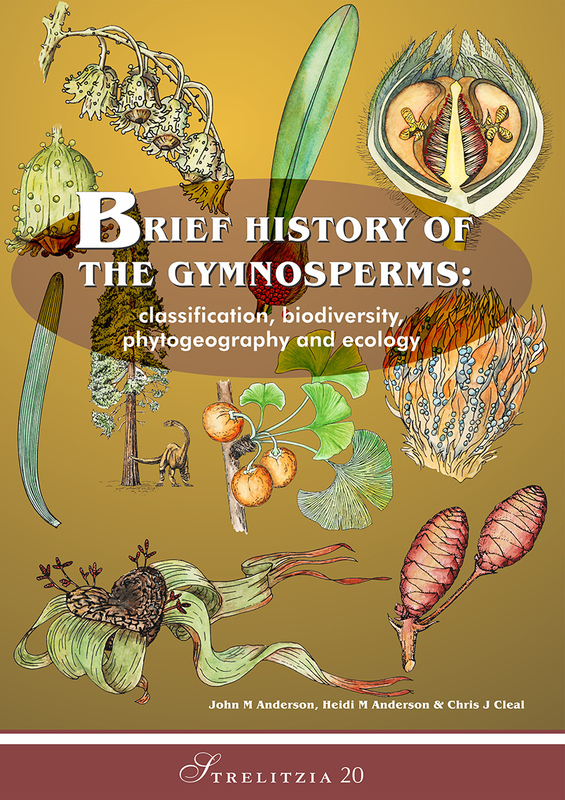 This book is an essential addition to the library of any horticulturalist, taxonomist, biochemist, pollination biologist, biogeographer or interested plant enthusiast. Soft cover. 239 × 177 mm. pp. iv + 114. The first edition of Botanical explorations was written by M.D. Gunn and L.E.W. Codd, and was generally referred to as ‘Gunn & Codd’. 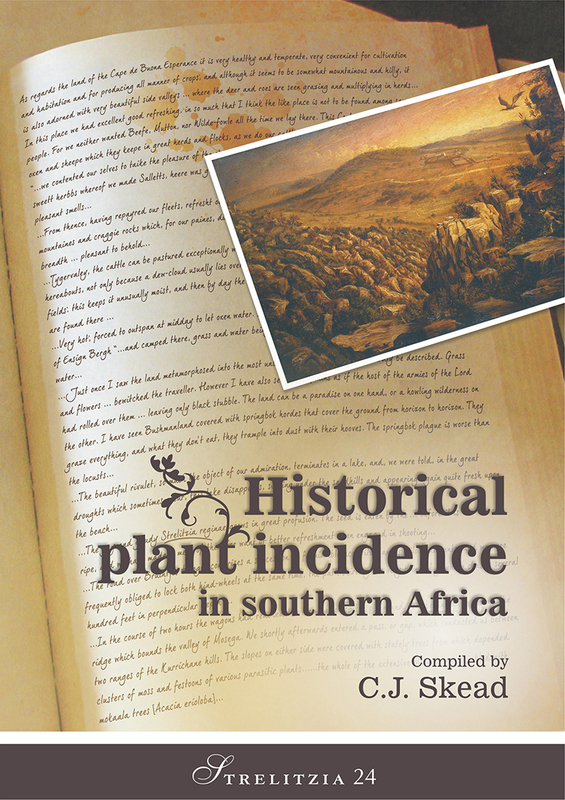 It was an invaluable source of information on the numerous collectors who have contributed to the world’s knowledge of the plants of southern Africa. During the last 30 years many new botanists have added to the list of collectors, and a revised edition has thus been produced. 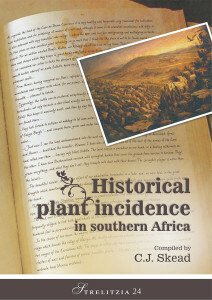 The book surveys the history of plant collecting in southern Africa, from the earliest records to the present day. It contains information on each collector that has made a meaningful contribution to botany in this region, as well as numerous black and white illustrations and photographs. Hard cover. 215 × 305 mm. pp. 489. This Red List is a major milestone for South Africa in that it is the first data-driven, comprehensive assessment of the country’s indigenous vascular flora. South Africa is among 17 megadiverse countries that collectively hold 70% of the world’s plant species diversity. It is the first among these countries to do a comprehensive assessment of the status of its flora. This landmark publication indicates that 13% of South Africa’s plant species are threatened with extinction and that one in every four plants is of conservation concern. 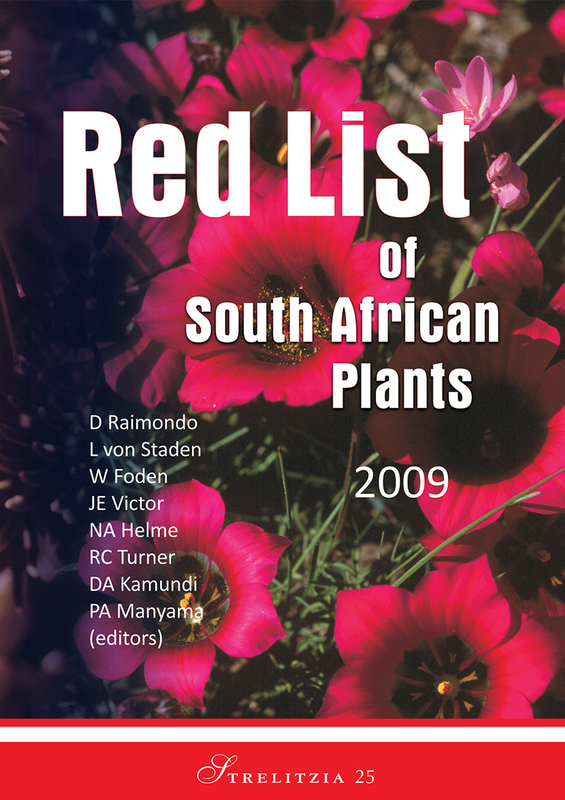 This is the first South African plant Red List to include detailed information on all plant species of conservation concern as well as a comprehensive analysis of threats to the South African flora. Guidelines for the application of this Red List are provided for conservation practitioners. Many species are depicted in colour photographs scattered throughout the text. 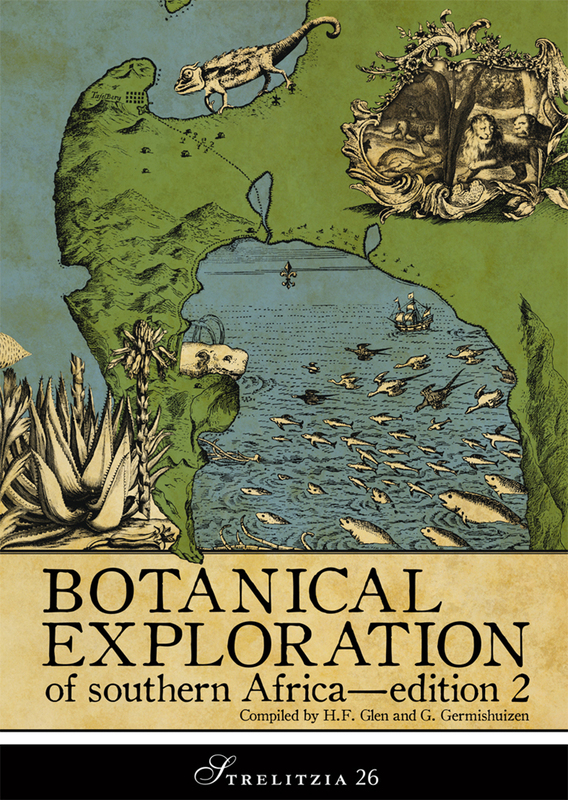 Published by the South African National Biodiversity Institute (SANBI). Hard cover. A4. pp. 668. This collection of observations by early southern African travellers presents a picture of the vegetation as they saw it, painted by the pens of the earliest European visitors to the Cape and by those who, coming after, penetrated the subcontinent. The review covers South Africa, with additional notes on the neighbouring Namibia, Botswana, Lesotho and Zimbabwe; the extracts taken from many diverse works. The partial picture given here should go some way towards helping ecologists and botanists to visualise early conditions and, at the same time, save themselves the chore of searching through many volumes for what might be no more than a minor item. The book will be of significant use to plant taxonomists, geographers, ecologists, environmental historians and students of climate change. Seven early landscapes by various artists have been reproduced in colour to lend interest to the text. Hard cover. A4. pp. 378. 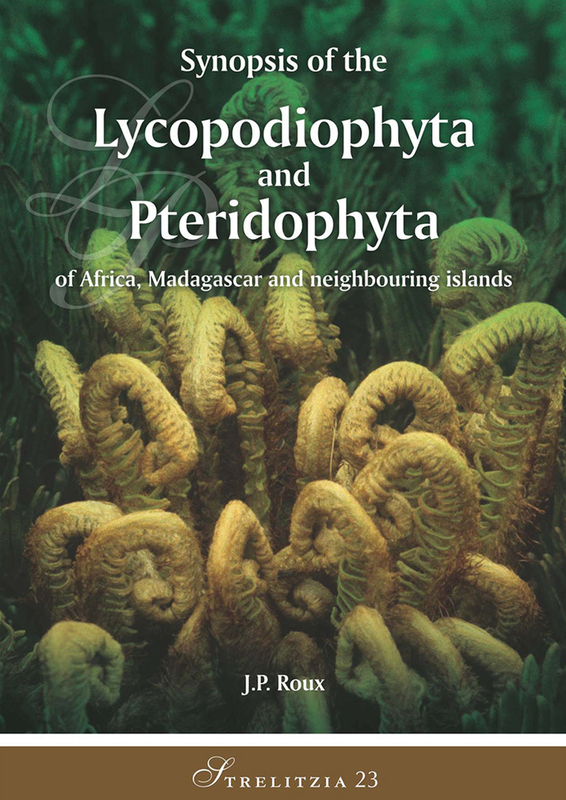 This is a modern account of the lycopod and fern diversity of the region and an essential tool for any future taxonomic or biogeographical study of its flora. Family and generic, as well as species and subspecific names are arranged alphabetically. Accepted names are followed by the author citation and the original publication. Basionyms, homotypic and heterotypic synonyms are provided. The provenance and, where known, the type location are provided for the names and their synonyms. Where available, the locality data, date of collecting, collector and collector’s number are given. Many names have been lectotypified, with an indication of the lectotypifying author, year of publication and page number(s), where available. The chromosome number, with a reference, is provided in many cases. The listing of species distribution by country is based on literature surveys and on limited herbarium surveys. Mainly black-and-white, with eight pages of colour photos. Hard cover. A4. pp. 255. 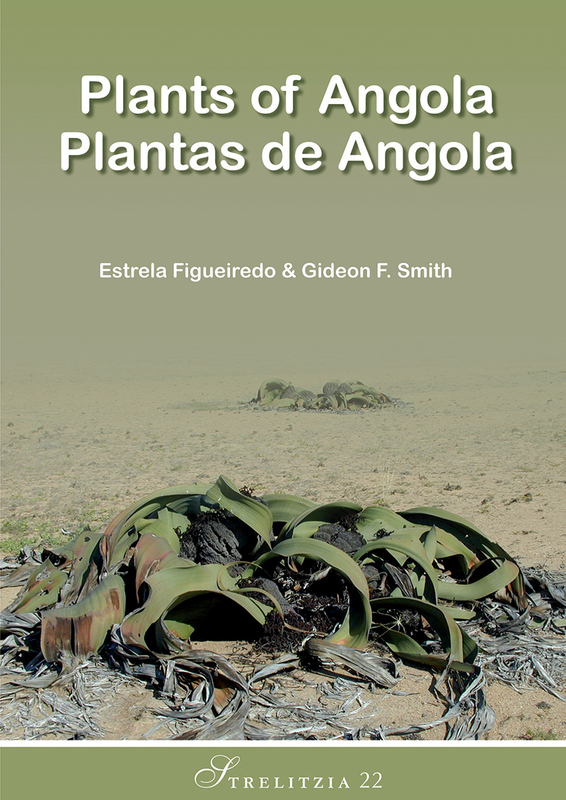 A comprehensive catalogue of the unusually rich, and poorly known botanical diversity of Angola, this book also provides extensive lists of scientific publications on the flora and on the floristic exploration of the country. The numerous botanical collectors who have operated there are listed and bibliographic references are given. 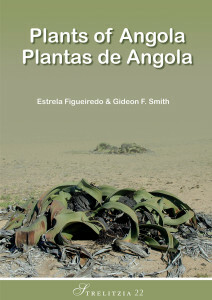 The work presented in this book is the result of the effort of 32 researchers from nine countries who collaborated to produce a comprehensive list of the vascular plants of the country. Hard cover. A4. pp. 279. 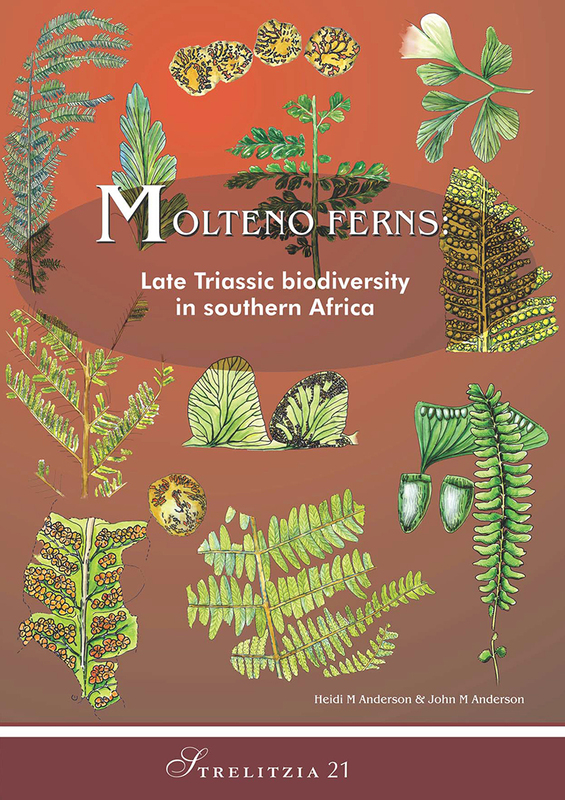 This monograph on the Molteno ferns is the fourth in a series describing the Late Triassic Molteno fossil flora. It gives a comprehensive description of the Filicophyta (ferns) from the Late Triassic Molteno Formation, Karoo Basin, South Africa. It is based on an overall collection over 27 000 catalogued slabs from 100 assemblages, with ferns being recovered from half of the assemblages. The fern fossils described include 18 species in seven genera based on fertile material and a further 18 species in eight genera known only from sterile fronds. The descriptions of the genera and species are supported by high-quality black-and-white photographs arranged in 100 plates and also by annotated line drawings. The volume benefits from the addition of 52 colour photographs, breaking into new territory in the series of Molteno volumes. Soft cover. A4. pp. 260. A global synthesis of gymnosperm families, fossil and extant, providing a new and distinctive perspective on the macro-evolutionary biodiversity trends within this group through their 375 million year history. The stratigraphic ranges of the 84 gymnosperm families are plotted according to their first and last appearances in the fossil record. A series of 30 full-page colour charts provide the holistic context in which to interpret gymnosperm history. Also included is a systematic coverage of floral kingdoms, biodiversity patterns, insect associations and other fields, traced period by period from the Devonian to Quaternary. 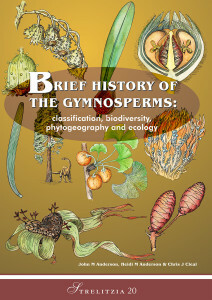 The final chapter covers gymnosperm biodiversity trends at the micro-evolutionary (genera and species) level, taken from a selection of some 13 important localities scattered globally and through the geological column. Richly illustrated with line drawings, tables and charts. Soft cover. A4. pp. x + 280. 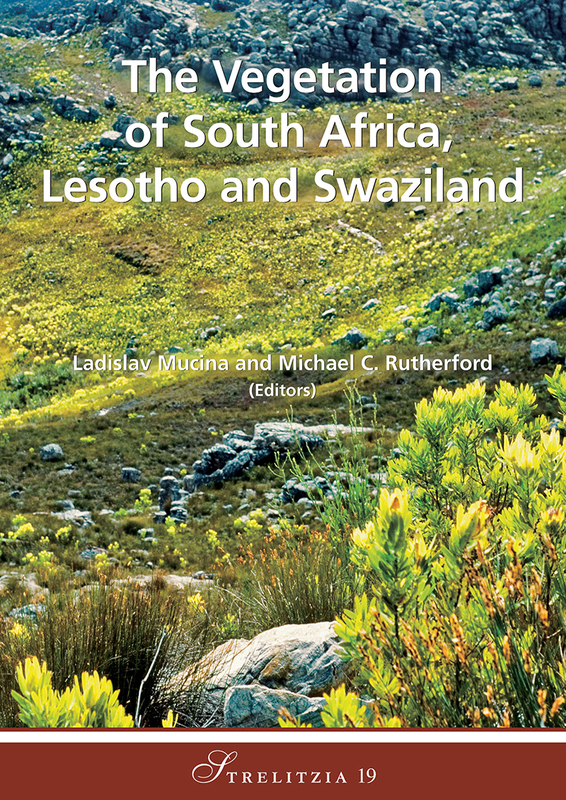 An up-to-date and comprehensive overview of the vegetation of South Africa and the two small neighbouring countries of Lesotho and Swaziland. This account is based on a vegetation survey using appropriate tools of contemporary vegetation mapping and vegetation description. The aim was to draw a new vegetation map that depicts the complexity and macro-scale ecology and reflects the level of (and identifies and reveals gaps in) current knowledge of the vegetation of the region. This is an extensive account of the vegetation of a complex and biologically intriguing part of the world, offering not only insights into structure and dynamics of the vegetation cover, but containing a wealth of base-line data for further vegetation-ecological, biogeographical, and conservation-oriented studies. Included towards the back of the book is an atlas as a systematic series of A4 maps depicting the various vegetation types. The electronic version on the CD inside the front cover allows the user to zoom in at any scale to discern detail. 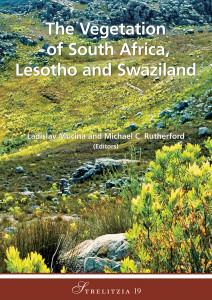 The Map and the descriptive account of the vegetation of South Africa, Lesotho and Swaziland target not only scientific academia and the secondary and tertiary education sectors, but offers a powerful decision-making tool for conservationists, land and resource planners, and politicians as well as the interested public at large. Hard cover. A4. pp. 816.The accompanying wall map is listed under ‘Posters’ and the electronic copy of the publication under ‘CD’s. Babiana, as now constituted, is largely a genus of the winter rainfall zone of western South Africa and southwestern Namibia. Just two species occur in the southern African summer rainfall zone, B. hypogaea and B. bainesii, the latter widespread and extending from the Upper Karoo through Botswana and Namibia to Zimbabwe and southern Zambia. 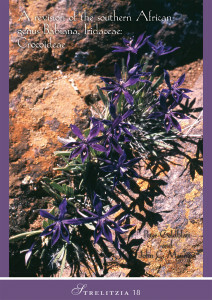 The authors recognise 88 species, a substantial increase over the 61 included in Babiana by G.J. Lewis in her 1959 monograph. This revision also presents a new infrageneric classification of Babiana, which is divided into three sections. Each species is described and 15 species are accompanied by line drawings, with 48 maps and 45 colour photographs. Excluded names, a list of references and an index to species and synonyms are provided at the back of the book. Soft cover. A4. pp. xii + 98.